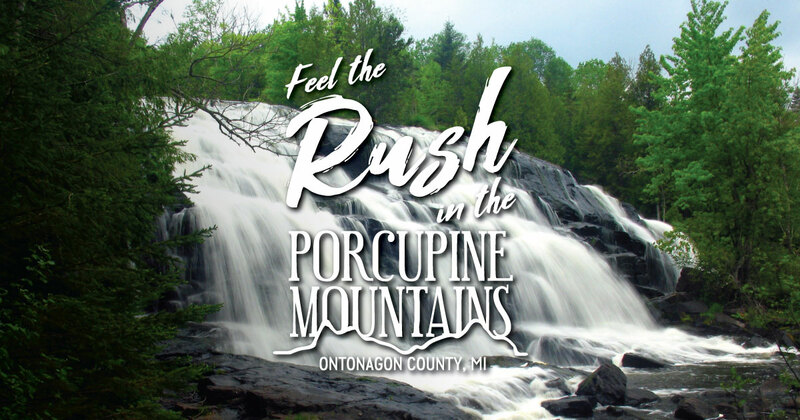 Anglers seeking adventure and a chance to catch something special will find it in the Porcupine Mountains and Ontonagon County. The rivers and streams that lace this area offer a perfect natural brook trout habitat. The experience can be as challenging as you like, and your efforts will be well rewarded—the fish are magnificent, providing a spirited catch. Here are some tips on how to catch brookies on your next trip to the Porkies. The main season for many of local streams runs from the last Saturday in April through the end of September. Some rivers are classified as Type 3 waters, which are open all year. State regulations outline what sections of rivers are open for fishing when and size limits on those waters. Consult area regulations before you head out. And hit the water early—some of the best fishing happens in the morning when the water is coolest. There are numerous streams and rivers that contain brook trout in the Porcupine Mountains and Ontonagon County, including the Big Carp River, Little Carp River, Presque Isle River, Union River and the Little Iron River. The fishing possibilities are vast—you can spend days without running into another angler. Backcountry fishing has some unique challenges. Some bug repellent can be a good idea, and sturdy boots are a must in some of our rugged areas. In some places you may have to scramble or climb a bit to reach the best pool. Brook trout can be caught with a variety of methods, but fly fishing is a rewarding choice and possible on our larger waters. Make sure to purchase a Michigan fishing license—they can be obtained at the Porcupine Mountains Wilderness State Park Visitor Center. Lodging is available near all of the productive fishing rivers, and there are comfortable options that can accommodate a solo angler or a large group. Book your fishing trip today!